Students from across the St. Louis area regrouped this morning as a follow-up to a first of its kind race summit last month. At the initial event, students voted on what they thought was the best solution to bridge racial divides in the St. Louis area. The winning idea was to create a sister-school program. Students from matched schools would temporarily "exchange" schools as a way to build relationships and understanding. For example, students at the mostly white Seckman, part of the Fox School District in south St. Louis County, will visit students at the mostly black Hazelwood East in north St. Louis County on March 10. Students talk about racial issues during a panel discussion at Ritenour High School. Seckman High School junior Kyle Edwards said the summit was empowering students to bridge long-standing racial divides. “They’re putting (student ideas) into action right here right now in front of our eyes,” Edwards said. Organizers asked students from the 14 high schools at the first summit to update their progress on the sister school program. The event at Ritenour High School included four more schools. Parts of the summit were streamed online. During a panel discussion with students, Missouri's Commissioner of Education Margie Vandeven asked what state officials can do to help students. The responses ranged from requiring high schools to offer a class on social justice to ensuring all students are held to high academic standards. Vandeven said she can take back several of those ideas to the state board of education. The event was put together by EducationPlus, an organization that represents St. Louis area school districts. Another event is scheduled for May. Read our earlier story below. It was published Jan. 15, 2015. (From Left) Seckman Senior High School Kyle Edwards, Hazelwood East seniors Justin Mason and Teanna Bass pushed their tables together and created the winning idea for bridging racial divides in St. Louis. After spending their morning listening to presentations about race, more than 100 students from 14 high schools were asked to come up with ways to overcome the region's deep racial divides. The students, selected by school administrators as leaders, were supposed to present their ideas to the larger group. At the end of the summit, students were to vote for what they thought was the best solution. As they began to work among their classmates, something unexpected happened. Groups of teenagers began hearing what students from another school were talking about. “I feel that it’s good to know they want to get to know us and we want to get to know them,” said Annta Blackwell, a junior at McCluer. Besides, Blackwell asked, what good does it do just to talk with other students who look like you? And soon, some students like Blackwell decided they should join groups from other schools. Teanna Bass, a senior at the predominantly black Hazelwood East, didn't know what to expect when she combined tables with students from mostly white Seckman High School in the Fox School District in Imperial. Her fear didn’t last long. Despite talking about difficult issues, Bass said, the conversation started to flow. Bass found herself at ease with Seckman high school junior Kyle Edwards despite their racial difference. At first Edwards was unsure of what to make of Bass. Students from Ritenour High School present their idea to tell student stories about diversity. In making their own personal connections across racial lines at the merged tables, Bass' and Edwards’ group came up with the winning idea: a sister school program. Students from matched schools would temporarily exchange schools as a way to build relationships and understanding. Edwards said the plan focuses on personal change because that’s where the collective group thought they could have the greatest impact. “It starts with student changing their mindsets because we are the next generation up,” Edwards said. “We’re going to be adults one day." This type of conversation is exactly what EducationPlus, which represents St. Louis-area school districts, wanted when it began work to put together the race summit. "We’ve always conceptualized this as the beginning or the catalyst for something the students are going to grow,” said Drew Schwartz, director of learning and career advancement at EducationPlus. Work to organize the summit began in October. Just like students hesitant to merge tables, Schwartz said some administrators were initially lukewarm to the idea. But 14 schools, including Confluence Prep Academy, Francis Howell North, Grand Center Arts Academy, Hazelwood Central, Maplewood-Richmond-Heights and McCluer signed on for the first of its kind summit. Now that a winning idea has been selected students will return to their schools and develop ways to refine the sister school concept. EducationPlus will host a student led follow up event on Feb. 25 with ultimate goal of getting the concept off the ground and a date has already been set for a 2016 race summit. This story is the first part of A Teachable Moment, a three-part series that profiles how issues raised by events in Ferguson are being discussed in schools and classrooms across the St. Louis region. Students were enjoying the last few weeks of summer vacation when mass demonstrations erupted in Ferguson following the fatal police shooting of Michael Brown on Aug 9. This story is the second part of A Teachable Moment, a three-part series that profiles how issues raised by events in Ferguson are being discussed in classrooms across the St. Louis region. From pulpits to protests, a wide cross section of St. Louis’ religious leaders has been deeply involved with demonstrations following the fatal police shooting of Michael Brown on Aug. 9. And for some teachers at religious schools in St. Louis, talking with students about the protests in Ferguson and Brown’s death is about more than education -- it’s a matter of faith. 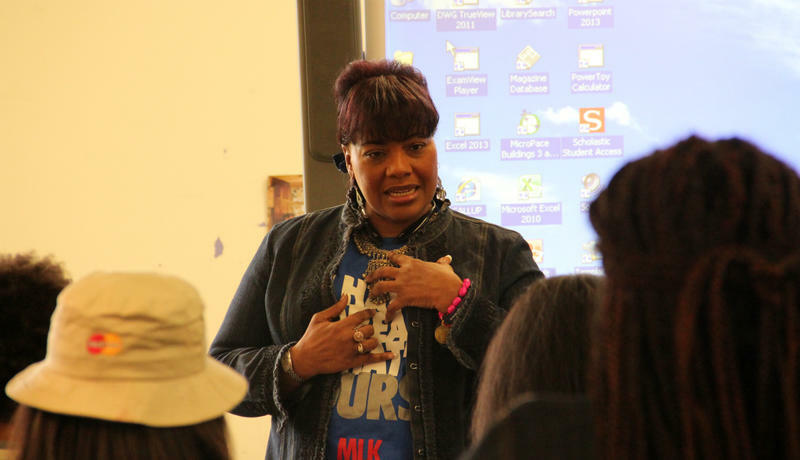 This story is the third part of A Teachable Moment, a three-part series that profiles how issues raised by events in Ferguson are being discussed in classrooms across the St. Louis region. St. Louis County Prosecuting Attorney Bob McCulloch has said that a grand jury could decide next month if Ferguson Police Officer Darren Wilson will face charges for fatally shooting Michael Brown. From elected officials to teachers to parents, many have expressed considerable concern about what the reaction to the grand jury's decision will be.